A group of researchers at the Max Planck Institute for Biological Cybernetics, in Tubingen, Germany, has the beginnings of a real world answer. The Cyberwalk platform is a large omni-directional treadmill that allows you to walk naturally through virtual worlds without experiencing any spacial limits. 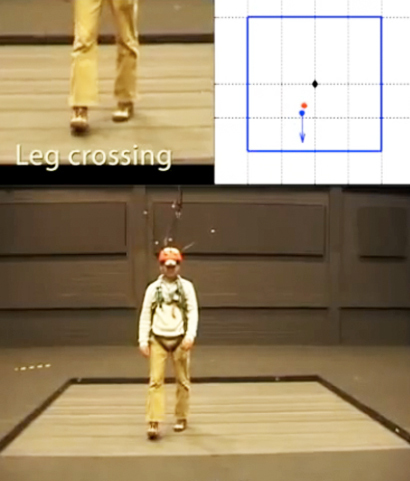 Using a Vicon motion-capture system, the platform has the ability to adapt in real time to the direction and speed of the walker. 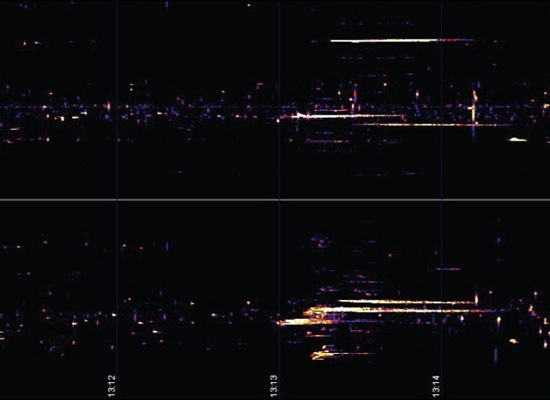 Above is the spectrogram to this five-minute sound file of space dust particles hitting Earth's ionosphere as they are received and recorded on Thomas Ashcraft's forward scatter radio array. We could probably listen to it over and over, replace our CADing music with an extended version lasting hours. It's like Haydn's The Creation re-composed by Ligeti. All night long eavesdropping on the earth infinitesimally accruing new terrain expelled by extraterrestrial landscapes. Is Eyjafjallajökull producing similarly marvelous soundscapes? As a recent article in The Economist observed, we are at the point of an "industrial revolution of data," with vast amounts of digital information being created, stored and analyzed. The rise of "big data" has led in turn to an increased demand for tools to both analyze and visualize the information. This bodes well for startups tackling the field. One new service is Flowing Media, the new company of Fernanda Viégas and Martin Wattenberg, a consultancy focused on data visualization services. Prior to founding Flowing Media, Viégas and Wattenberg worked for IBM's Visual Communications Lab. Their Many Eyes project was one of the first to put visualization tools in the hands of the public, with the goal of democratizing visualization and the accompanying social analysis. According to Viégas and Wattenberg, visualization is a powerful analytical tool for experts and non-experts. "It's an excellent way to attract non-geeks to complex data and can spark conversation." 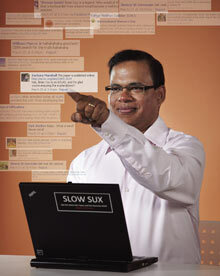 They note that a good visualization can easily go viral on the Web, touching millions of people. 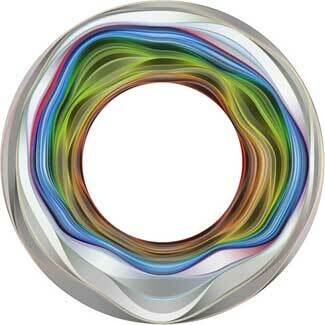 As "big data" becomes more accessible, visualization services like Flowing Media are sure to flourish. After all, as Viégas and Wattenberg note, "Today many facets of life are made of nothing but data, from flirting on Facebook to photos on Flickr." Image credits: Fernanda Viégas and Martin Wattenberg, top: Wired Magazine - "A visualization of thousands of Wikipedia edits that were made by a single software bot. Each color corresponds to a different page." and bottom: Flickr Flow, the colors in photos uploaded to Flickr.